I am heaving a huge sigh of relief at the moment. I have spent the last two and a half days doing nothing but go over my manuscript with a critical eye and do everything I can think of to improve it before having to send it out. It is hard, tedious work, and mentally exhausting. However, it feels wonderful to have finished it for the time being. The manuscript has been sent and I have nothing more to do with it while I wait for my fate to be decided. I vaguely remember Sunday. I made dinner, none of which I could eat. I made peach cobbler, which seemed to go over much better than rice pudding. Yesterday I just edited all day. My paint job in the schoolroom is unfinished. I couldn’t take time out to paint. 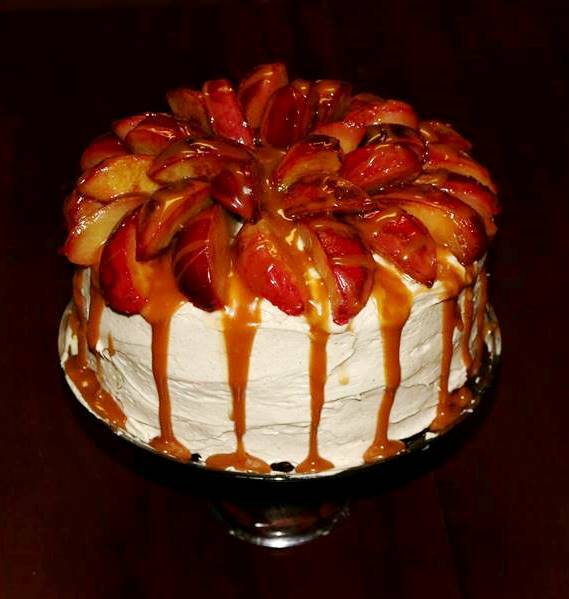 It involved two layers of carrot cake, sautéed apple and plum slices, cream cheese icing, and caramel. Some days it really stinks to be a diabetic! I have had a request for a full manuscript from a publisher I spoke with at Realm Makers. I am going over my story one last time with a fine-toothed comb before sending it off, so please excuse me if I don’t have time to blog! Today, despite feeling exhausted and sub-par all day, I did get something done! I cleared everything away from the wall that I wanted to paint, and it now has two coats of paint on it. Mercy and I did it, meaning Mercy did most of it and I did what I could. We still have the door frame to paint, so there are no photos yet. It was fun having Mercy here for much of the day, though she did have to go to rugby practice this afternoon. There were two other places I could have been today. One was at the Texarkana Renaissance Faire. It was weird not to even go this year, when last year we had a booth. I was sorry to miss it. The other place that I wish I could have been was in New Mexico at my friend Donita’s wedding. I am so happy for her and wish I could have been there with her on her big day. This evening Mercy showed us the rest of her China photos. She saw some beautiful places, but I noticed that some of them were very, very crowded. That would make them a lot less enjoyable for me! Would you believe I had to run a pre-dawn errand today as well? We somehow found ourselves completely out of milk. My husband doesn’t drink milk, but he likes it in his tea, and he is not interested in substitutes, so once again I was out the door by 6:00 to go buy milk. The nearest grocery store opens at 6:00, so when I got there, they were just getting going. I discovered that they cover all the refrigerated cases with insulated blankets at night. The main accomplishment of the day was going to the post office twice–once to buy a box, and the second time to mail the same box. I spent the evening re-organizing my binder full of hymns for the autoharp, after chording a hymn for Sunday. I decided to finally put my hymns in the same order they are in the hymnbook, so it will be easier to find them. At least I don’t have to feel sorry for myself tomorrow morning. I get up early on Saturdays anyway! And I’m pretty proud of myself for hanging in there with the early mornings all week. Maybe next week it will be easier. Today was another Caribbean day here. It was also an early-rising day. In fact, I got up at 5:55 and was out the door by 6:00 because I needed to pick up some photos at Walgreens so I could use them to make flash cards. Then I worked on some class preparation, made our class dessert, and had breakfast, after which I felt ready to get another night’s sleep! Today was definitely an extra-caffeine day. Lucy and Haley eventually got up and started work on today’s food, which was Puerto Rican bean stew and fry bread. Meanwhile, I continued to research more stuff about the Caribbean until the very last minute! The food was good–I’m pretty skilled at picking recipes, even ones for food I know I won’t get to eat. We looked at a lot of gorgeous photos of various Caribbean islands and again tried to figure out a way to make a field trip happen! I even played the Beach Boys’ song “Kokomo” and had the girls listen for how many Caribbean locations are mentioned. We also talked about some history and the current tourism-based economy in the area. I love that all three of my students seem to get into the material and are willing to try the food. After class I took Jasper and his buddy Sam to the local beekeepers meeting–not the one that’s an hour away, thank goodness! I was so, so tired and sleepy by then and would have preferred to stay home. I ended up being glad I went, just to see Jasper and Sam talking to Gabe (whom Jasper met back in the spring) and his brother and they were all so enthusiastic about bees! Beekeeping needs all the young enthusiasts it can get! Boy, was it hard to get up at 6:00 this morning. I was glad Lucy had a ride to her classes, but I still had to make sure she got up and got ready. When I went to pick her up, her friend Haley came home with us. The plan is for her to help with the cooking for Geography class tomorrow. My day was all about geography. This time around I am trying to find more photos of each country so the kids can get some idea of what they look like. I was happy about fall starting today, but disappointed that Mother Nature didn’t get the memo. Temperatures are expected to remain in the 90s for the next 10 days. If I have any hope of making it up early again tomorrow, I’m going to need to get some sleep! Like I expected, it was harder to get up this morning than yesterday, and I expect tomorrow to be harder still. I did it, though. I had a lot of class prep to do, especially after I realized the grammar book had a series of quizzes about topic that the book did not actually cover! So I had to create my own resources and that really put me in a bind timewise. We watched several scenes from Much Ado About Nothing and I have no idea if the students enjoyed it or not. They are very hard to read and rarely volunteer their opinions about anything. After my class I had to rush off to critique group. As always, my critique partners had some excellent advice for me. I am so thankful to have them. Then we had our regular writers meeting and the speaker was a writer I’ve become acquainted with over the years. She talked about writing Christian fiction and what she said confirmed that this is not what I write. I am a Christian writer who writes fiction, but not a writer of Christian fiction! I also finished my knitting project. Now I’ve got tomorrow to prepare for Geography class on Thursday. You know what one of my biggest goals was at the beginning of this year? To start getting up early again and of course that means going to bed earlier too. I don’t know why I couldn’t seem to do it. Even though I am not by nature a “morning person,” I am honest enough to admit that I am more productive when I get going on my day earlier. And lest you think that I’ve been lolling about in bed till noon, it’s been more like 7:30. The problem is that my husband leaves for work at about 6:45. We used to have tea together every morning until I started finding it so hard to get up, and I want to be able to do that again, so this morning I was determined to turn over a new leaf. When the alarm went off at 5:55, I got up and stayed up. I didn’t die. I had a hot drink with my husband before he went to work. The real test is going to be tomorrow and all the days after that. I promise you will hear more about this, whether you want to or not. We got school done today and then I did something Jasper has been asking for for a long time. I helped him set up an email account. I am skeptical that anyone will be able to read his emails, but he really does need to have his own email. He is pretty happy about it! I also went to the Mexican grocery store for an ingredient and ended up having to order it online. Cooking for geography takes a lot of advance planning! My rush knitting project is almost done so I’m feeling a little less panicky now.